Project Overview: The Butler Ridge Project, a 36-unit wind farm, was developed on the Niagara escarpment, a ridge that originates in Ontario, Canada, runs through Wisconsin and ends in Illinois. In Dodge County, WI, the ridge reaches an elevation of 1,200 feet, creating one of the superior wind resources in Wisconsin. Local land use is largely tilled agriculture, which creates few obstructions to the prevailing winds. 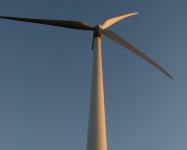 The Butler Ridge Project takes advantage of this wind resource (Class III wind) with two 54 megawatt (MW) turbines. The electricity generated from this facility can power 18,000 homes.